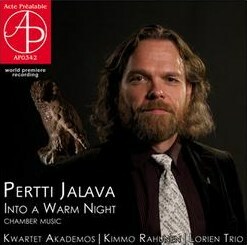 Finnish composer Pertti Jalava writes music with strong narratives. You can be assured of an almost filmic quality in his compositions and this, allied to an interest in Jazz rhythms, vests his chamber works – all that I have to go on for now – with strong character. Rhythms can be tensile or asymmetric but they are invariably a strong motor in these ingenious works. He has a penchant, too, for arresting titles. The Eagle-Owl, written in 2009 – he had only been a full-time composer since 2001 – is a case in point. It’s written for a Guitar Quintet - guitar and string quartet - and is cast in four movements. Much here is filmic, visual and formed of little rhythmic cells. There is a scurrying mouse, a more meditative movement called On a Dewy Meadow and then an expansion to include more scurrying unison figures, a cadenza, jazzy syncopations and a brief, though almost rock-based vibe for the guitar. The finale is the movement that is given the title The Eagle-Owl and it is by far the longest of the four – a summation of his warm textures and almost Sibelian sense of development. It sustains its 13-minute length effectively and more than once I was put in mind – sonically speaking – of Janáček, another composer whose rhythmic cells give his music such a vitalising if sometimes unstable character. The Six Miniatures for Guitar are slivers in which he uses the tone-row with some panache, ensuring that the music remains dance-like and lyrical. A feint toward Tarrega-like sonorities is very brief. A strong narrative sense also courses through his String Quartet No.1, called Pictures of Spring Stream which charts, in a compressed ten minutes, the ice melting, bubbles playing under the ice, the premature emergence of butterflies and the final arrival of Spring. All this is accomplished with razory articulation to evoke the ice, ostinati and pizzicati being allies in this projection. Occasionally the music turns terse or abrupt and in the final movement, where the ice once again threatens, a strong sense of symmetry is established which gives the Quartet its strong linear sense. The final piece in this disc is While You Were Sleeping I Opened The Door and Walked Out Into a Warm Night, written for the very French combination of viola, flute and harp. Not surprisingly concert promoters shorten the title to a more manageable length – at least on billboards. Each movement evokes one part of the title – thus we have a balmy night with birdsong, full of colour and texture like a Rousseau painting. Though the ethos, given the instrumentation, might be thought to be French once again the reality is that it’s more overt and filmic than that would imply. Jalava is a generous composer and his music is always very visual, and very tactile. Part infused with Jazz - though it’s a subtle infusion and largely limited to matters rhythmic – his chamber music is personal and pleasing to hear. Its nature painting is rooted in his Finnish background and is always lively, and energising.